It’s not easy to choose the right digital agency. But since 1998, we’ve been making the choice easier by helping B2B marketers out there make better decisions (with better results) for their brand and growth. Here at BayCreative, we specialize in providing our clients a full, creative experience through digital storytelling. From branding and design, to video production and demand generation, our team has helped a wide array of companies, from startups to enterprises. We take on every project as a unique challenge, understanding the specific ins and outs of each client experience, as we collaborate on developing solutions. We’re proud of our work, and thankful for the recognition we’ve earned as a result. Earlier this year, the B2B ratings & reviews firm Clutch recognized BayCreative as a Top Full-Service Digital Agency in San Francisco. 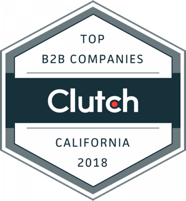 Now in the second half of 2018, we’re even more excited to now be named by Clutch as a Top B2B Service Provider in California! And to top it all off, Clutch’s content-driven sister-site, The Manifest, also named us a Top Digital Marketing Agency in San Francisco. The BayCreative team is excited to be honored in our hometown and home state, and grateful for all our wonderful clients. Read what they have to say about their experience working with us, and see portfolio examples of work.